Hey everyone! Today, my family and I are headed to a baseball game. Each year, my husband's company gives their employee's free tickets to a Las Vegas 51's game, and since it's one of the few events that is family friendly, we always look forward to it. Now I'm no expert on sports, but I am married to a huge sports fan, so many of our outings together in our marriage and dating years have revolved around sports. I always say that I like the social part of sporting events. I like hanging out with friends, drinking beer and eating food. 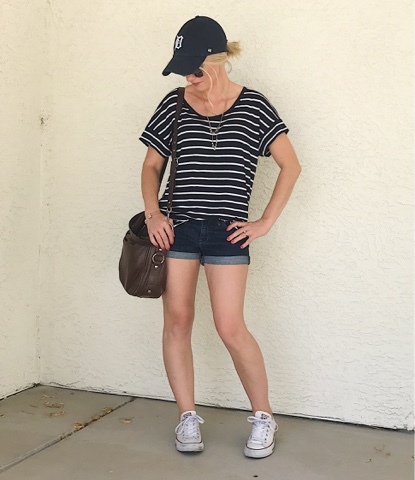 I also like to put together cute sporty outfits. 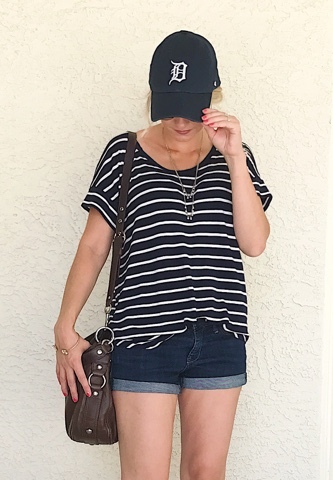 Whether it's tailgating or a baseball game, I always like to dress down, but also look cute. 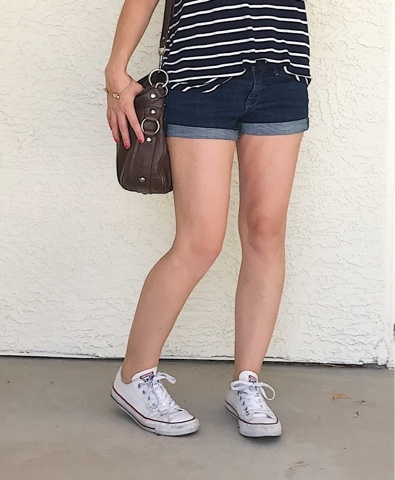 For todays outfit post, I decided I'd share the outfit that I put together for the game tonight. 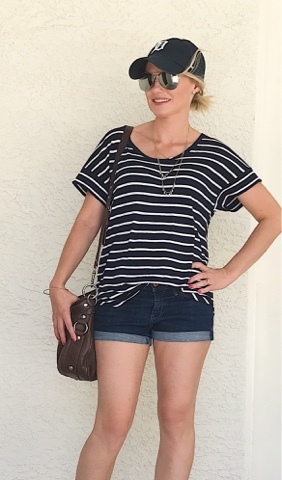 I'm wearing my thrifted Abercrombie shorts with my thrifted Gap navy stripe t-shirt. Since not many people are from Las Vegas, everyone seems to sport their hometown team at the 51's game, that's why I'm wearing my Tigers hat. For my shoes, I went with my Convers, because I think that they complete the sporty look perfectly. *This post contains affiliate links. By clicking and/or making a purchase through a link, I will make a small commission with no additional cost to you. Thank you for your support.